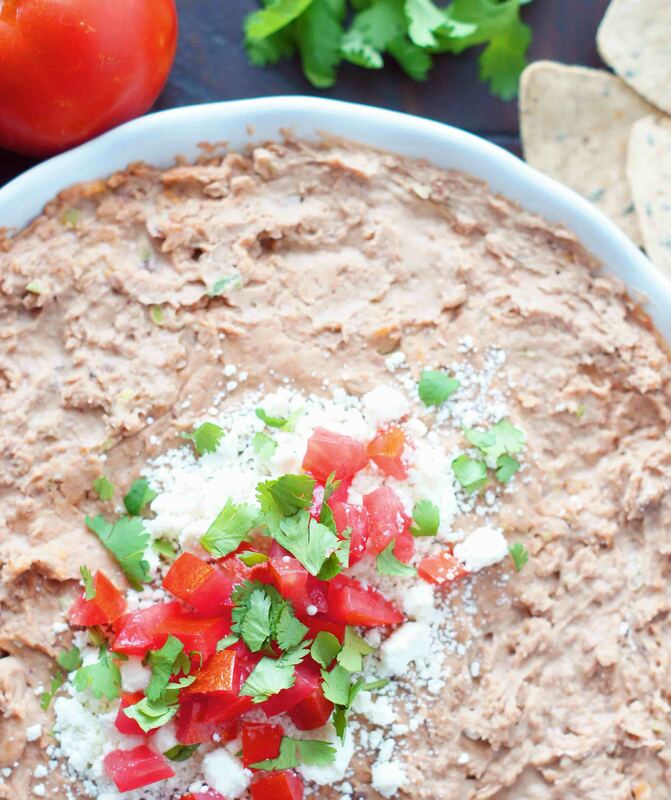 This Creamy Jalapeno Bean Dip is pretty much the bomb! It’s so simple to make and perfect as a side dish, appetizer or snack. Get ready to fall in love! Mexcian food is a huge favorite at our house. Tacos, enchiladas, burritos, etc, we love it all! 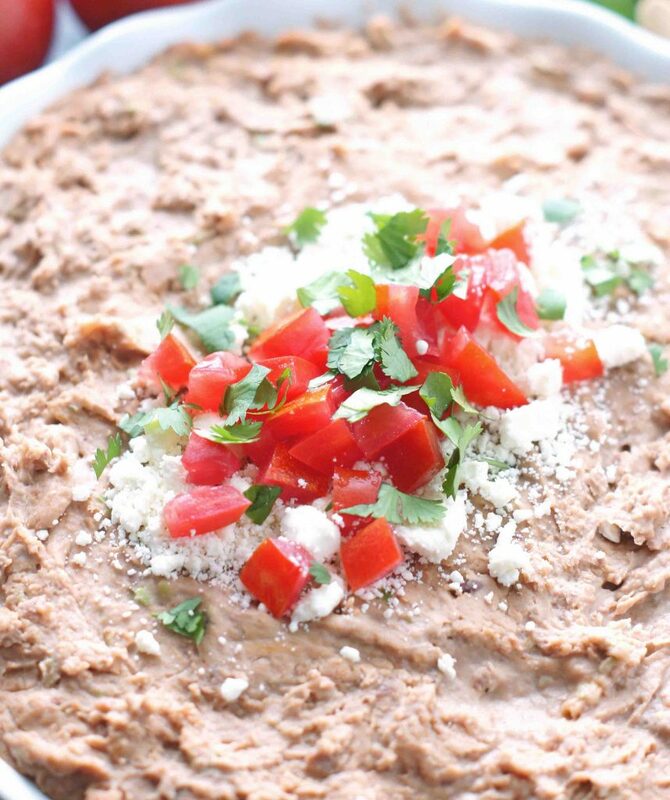 We especially refried beans. A lot of times to go along with our Mexican dinner, I’ll open a can of refried beans, spread them in a pie plate, throw some cheese and top and heat them in my microwave or I’ll make homemade refried beans in my slow cooker. Either way, we love them. 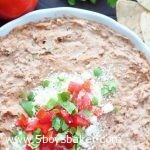 When I saw this recipe for Creamy Jalapeno Bean Dip it was a no-brainer, I knew I had to try it. We loved it! To say my husband loved it would be a giant understatement. He took it for lunch the next day, just the dip, no leftover enchilada to eat along with it. . . just a Tupperware full of dip. Now about the toppings. The feta cheese is an absolute must. It gives this dip a whole new meaning. The diced tomatoes and cilantro are so yummy on it too. They add freshness, flavor, and color. Now don’t think you just have to use tortilla chips for dipping. This is sooo good with veggies (carrots, cucumbers, celery, etc). Whatever you use for dipping, this will be fabulous! If you don't like a lot of heat, remove the seeds and membranes before you chop your jalapenos. This makes a fairly large amount of dip, so you can easily half this if you'd like. In a large bowl, combine all ingredients together on medium speed using a hand mixer until well combined (or use your electric mixer). Spoon mixture into a large baking dish (a 9x9 or 8x8 pan works, or a 10-inch pie plate works great too). Top with feta cheese, diced tomatoes, and chopped cilantro.